The event was the first occasion that the Vareo was showcased live at a Mexican trade fair. It is designed for digital and offset printing and each of its three clamps are equipped with their own servo motor and driven individually. 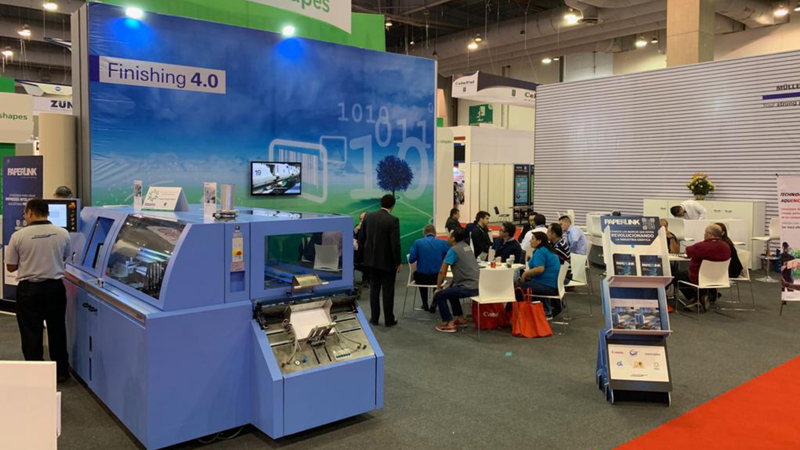 Accordingly, it met with great interest among the over 400 visitors to the booth from Mexico, as well as the neighboring countries of Costa Rica, Guatemala, Honduras, Colombia, Panama, El Salvador and Ecuador. The Vareo perfect binder drew large numbers of visitors to the Muller Martini booth at Expográfica in Mexico City. Muller Martini’s live demos showed that the Vareo – an all-rounder which boasts an excellent price-performance ratio – comes into its own not only in digital printing for ultra-short runs right down to one copy per job, but also for medium runs, regardless of whether the brochures are produced using offset or digital printing. Hector Castro, Muller Martini Managing Director for the Latin America region, had two reasons to celebrate – as well as being delighted by how well-attended the booth was, he also had the opportunity to toast Muller Martini Mexico’s 20th birthday at the trade fair together with customers and staff.